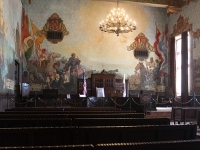 The Santa Barbara County Courthouse was constructed in 1929 and is a complex of four buildings occupying an entire city block in downtown Santa Barbara. 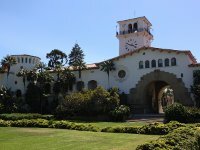 It was designed by master architect William Mooser in the Spanish Colonial/Moorish Revival style. It is an extraordinary example of its style, with an elaborate array of detail emulating a Spanish castle or fortress. 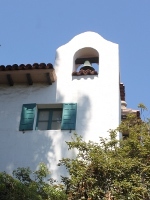 The clock tower includes an observation deck and is open to the public. 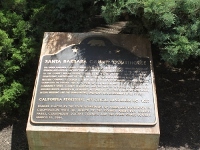 Southwest corner of the building. 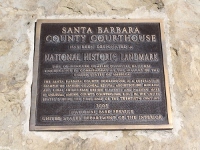 The courthouse is also a National Historic Monument. 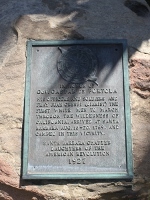 A plaque from the Daughters of the American Revolution commemorating the 1769 Portola expedition.